Before I came to college I wasn’t at all into sports. My high school didn’t have a lot to offer to spectators and I was never very into watching professional sports. When I came to UVA I learned how exciting college athletics can be. Some of my best memories from college have to do with attending sporting events. Everyone knows about basketball, it has already warranted its own post. But UVA has so much more to offer in addition to hoops. The athletics program boasts 25 varsity athletic teams and has won 21 national championships, the most recent victory belonging to men’s soccer. Women’s soccer and men’s baseball are up there too, both finishing second nationally within the past year. UVA’s student section, Hoo Crew, does a good job of promoting student attendance at a variety of sporting events. Not only does more varied attendance give you a better chance of getting tickets to basketball games at JPJ, but it makes you a more well-rounded and dedicated fan. My personal goal is to try to attend an event for every sport. In my experience so far I can say soccer, baseball and lacrosse events are just as exciting as any other sport. 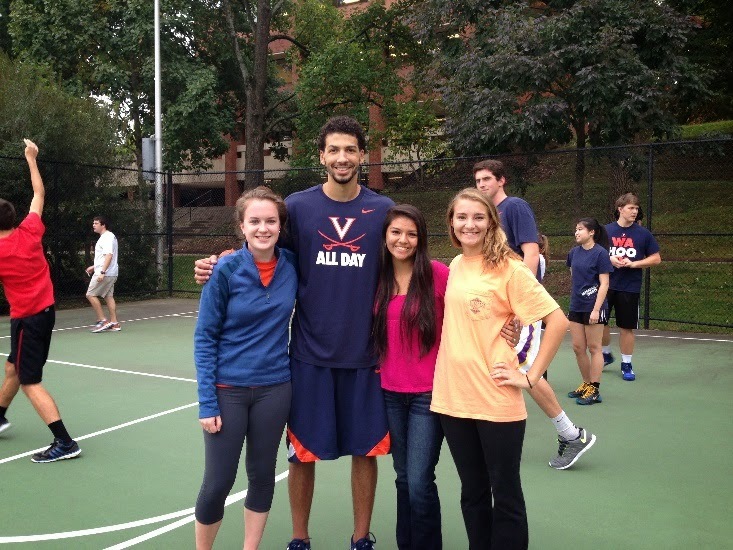 As an extra bonus, many times varsity athletes will come out to support other sports at UVA. For example, last year Joe Harris threw the ceremonial first pitch at a baseball game at Davenport Field. 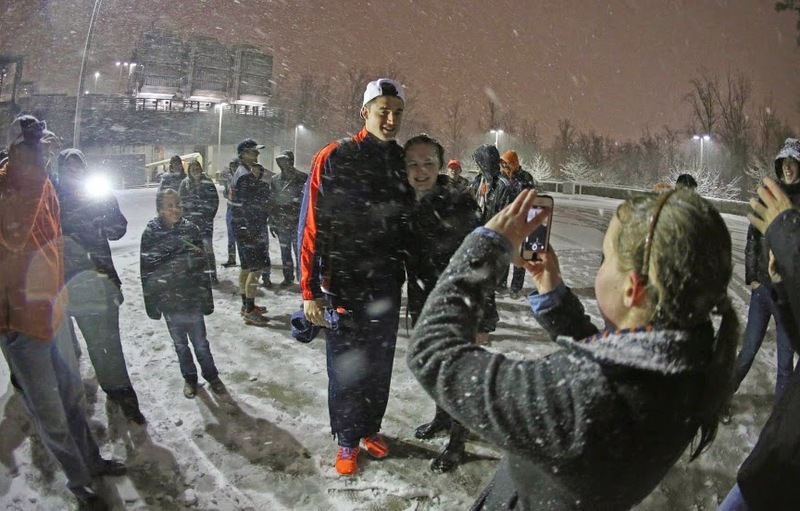 In addition, men’s basketball players can be spotted at the women’s games at JPJ. If you’d rather play than watch I would recommend looking into club sports or intramural sports at UVA. Club sports are more competitive and intramural sports are much more casual. For intramurals you can sign up with a group of friends, your dorm or as a free agent. These sports range from soccer and football to ultimate Frisbee and dodgeball and are always a lot of fun. So no matter what your degree of enthusiasm for sports may be now, be prepared to become an instant fan when you come to UVA! So What Exactly is Happening to the Rotunda? 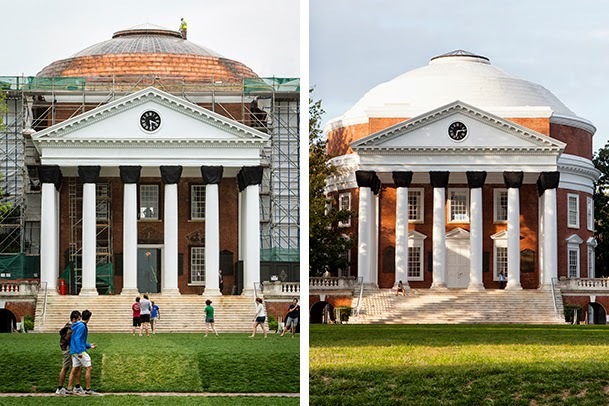 UVa's Rotunda is getting quite the makeover. When you're almost 200 years old, you could probably use a face lift, too. Three years after the University of Virginia was established in 1819, construction of the Rotunda began and was completed in 1826. Jefferson's original plans for the Rotunda included exercise yards, classrooms, and a library. Once Alderman Library was created in the 1930s, the Rotunda was no longer central to academics. The Rotunda renovation is meant to restore Jefferson's building back to its original purpose. In 2016, it will resume its former role as a library and classroom building that unites students and faculty in an academic setting.Today, the Rotunda is a World Heritage Site and the core of UVa's grounds. The second phase of this renovation costs around $42.5 million. Don't worry, tuition money is not paying for it. Actually, the majority of funds are from private philanthropy. How thoughtful! Pros and Cons: Since the Rotunda is the centerpiece of UVa, its construction has undoubtedly altered events and traditions. For example, 2015 Final Exercises will occur during two days in May instead of one. As a result, the College and Graduate School of Arts and Sciences will have their Final Exercises on May 16 and all of UVa's other schools will have theirs on May 17. This limits students to allowing 4 guests and prevents some friends and family members from graduating together. On the other hand, the renovation will give students the chance to attend classes in Jefferson's self-designed building. It'll allow the UVa community to connect and embrace the history around them. The Rotunda isn't just a historical landmark, it's a symbol of neoclassicism, education, community, history, and dear old UVa. As many of you know we hold online chats a couple times a semester for perspective students to ask any questions that they have which current students do their best to answer. From my experience, one question is asked more than any other: why should I come to UVA? Now I can't speak for why any of you reading this should come here, so I will just list some of the many reasons why I chose UVA and why I haven't regretted that decision for a second since coming here. UVA is consistently rated among the top schools year after year (we're currently tied as the second best public school in the nation according to US News and World Reports. As an in-state student, you really can't beat the price for the quality of education that you are getting. There is a wide variety of majors available as well as options for double-majoring or minoring so you can explore all of your interests. Not only is UVA only a few hours from my hometown in Northern Virginia, downtown Charlottesville is just a quick drive (in a car, bus, or the free trolley) from grounds which offers entertainment, food, and a change of scenery. Everyone who I talked to, current students, former students, and administration, absolutely love UVA. Sure, everyone has things that they don't like as much but overall the amount of school spirit people have is amazing. The most important thing when deciding on a college is how you feel when you visit there and whether you can picture yourself there or not. I have to admit that it took me about three visits to really get the feeling that I would like to come here but I definitely felt that connection before committing. At the end of the day, while statistics, rankings, and the feelings of school spirit that students have are great, only you know what school is right for you. I do however, have to highly recommend a visit here either just for a tour or as a part of Days on the Lawn to get a feel for how awesome UVA is. 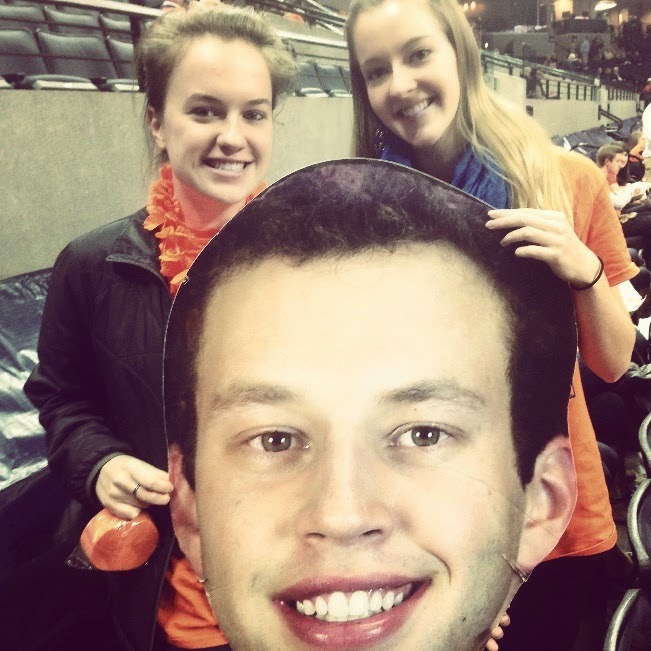 One of the greatest privileges enjoyed by UVA students is to be a fan of the men’s basketball team. Unless you’ve been living under a rock for the past few years, you’ve probably noticed that we are pretty good. Currently ranked #3 in the country, UVA basketball is no longer an up-and-coming team. It has the capacity to compete with the very best. I believe that since we are this good and since Tony Bennett is such an awesome person it would be a total travesty to not take the opportunity to become a rabid fan while you’re a student at UVA. Therefore I have come up with a list of my top five moments as a UVA basketball fan. 5. Ranking in the top five has to be my first time experiencing a men’s basketball game at JPJ. The atmosphere is indescribable and the team can easily feed off of the energy of the fan base. Charlottesville loves UVA basketball. After my first game I was hooked and I have missed very, very few home games since then. 4. An opportunity I would recommend to any basketball fan is Ball with the Hoos. This event is held in the fall, prior to the basketball season. Students can participate in games like knockout and the three point challenge against actual players. Although my attempts to score points in these challenges were less than successful, it was still so much fun. All of the players are incredibly welcoming to their fellow students. 3. The most recent event on this list is ESPN College GameDay. Held this past Saturday at JPJ, the ESPN broadcast showcased the loyalty, craziness and intensity of the most rabid UVA fans. 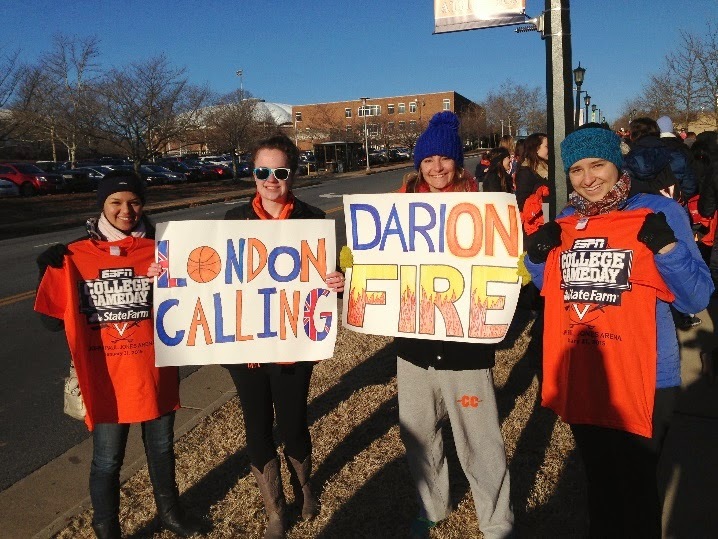 More than 5,100 people attended the event and brought creative signs and high-pitched screams in support of the basketball team. As this was the first time GameDay came to Charlottesville, I believe it is truly a testament to how far the program has come. 2. Meeting the team’s bus at JPJ after their win at the ACC tournament in Greensboro last March was absolutely incredible. It was freezing cold and snowing hard, yet fans still showed up and waited to congratulate the players in person. Honestly, it was probably the most excited I have ever been. 1. Number one on this list has to be watching the team win the ACC tournament title. 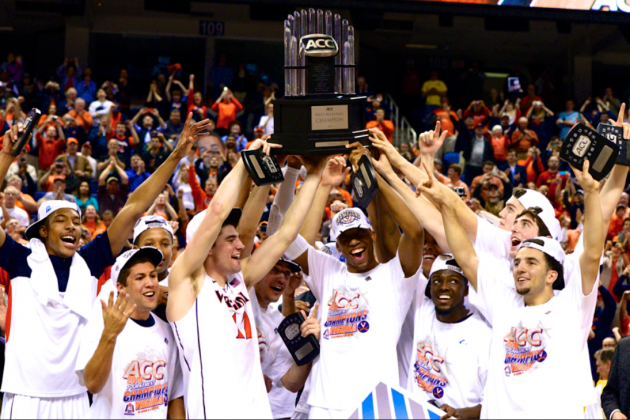 It was a fitting sequel to an ACC regular season title. Although I did not attend the game in North Carolina, I still watched on TV in Charlottesville. That game was perfect. Last year’s season was nothing but historic and I know that the years to come will only further prove how deserving Virginia is of national recognition.